The Duluth & Iron Range Railroad contributed greatly to the development of Two Harbors. In 1883 it built the Lakeview Hotel to serve as a boarding house for its employees. As ore production grew, the railroad grew as well, and its transient workers needed something to do with their time off. So the railroad found itself almost singlehandedly supporting the local Y.M.C.A., going as far as building it a clubhouse in 1898. 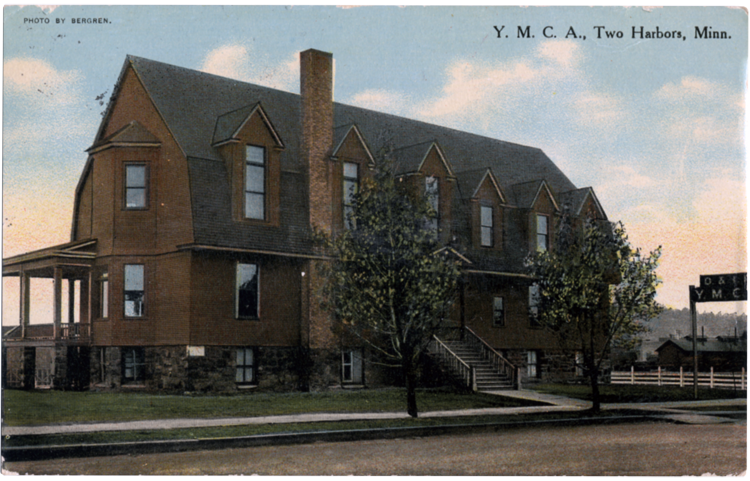 The structure, located at First Avenue and Seventh Street, was a large three-story woodframe building that held an office, a “boy’s room,” a reading room, a parlor, a game room, a reception room, forty-eight sleeping rooms, and, as the Duluth News Tribune reported, “well kept toilets with laundry.” The facility also boasted a swimming pool, a gymnasium, and two bowling alleys. Two years after it opened it had 400 members. Some of them organized a camera club and captured what were considered some of the “finest views in this vicinity.” The facility was also used for religious, social, and educational work. In the 1920s its 960 members each paid annual dues of $5; the D&IR also paid a “substantial sum” each month for maintenance and repairs. In 1923 the Two Harbors Y.M.C.A. opened a camp thirty-five miles away at Lake George and shared it with the Salvation Army. Boys and girls each spent three weeks at the camp, and the Salvation Army used it for another week. The Duluth & Iron Range Railroad Company built and maintained the Two Harbors Y.M.C.A. building. The “Y” was inextricably linked to the railroad, and older publications often refer to it as the “D.I.R.Y.M.C.A.” or the “R.Y.M.C.A.” It was torn down in 1962.